Once again, Playtech have delved deep into the annals of classic television to bring us The Six Million Dollar Man slot machine. It is, of course, based on the series of the same name, and features more than a few nods to the original content. The imagery and sound effects remain true to the theme, and it’s only a few issues in the game’s feature department that let this title down at all. True to the theme. The classy lounge music combines well with the futuristic art style to give a look and feel that is consistent with the original content from the franchise. A little limited in the feature department. We’re not big fans of bonus content that players need to pay for, and this is the case with the “bionic spin” option. Had this feature been alongside another free-to-use bonus, it would be fine. However, having only one feature accessible for base-rate players feels a little on the stingy side. The Six Million Dollar Man “wild” = 4,000x the line bet. Oscar Goldman = 500x the line bet. Bionic eye, hand, or foot = 300x the line bet. Numbers, or chart display = 200x the line bet. During the main game, a “Bionic Spin” lever can be used to opt to play the game in the “Bionic Spin Mode”. 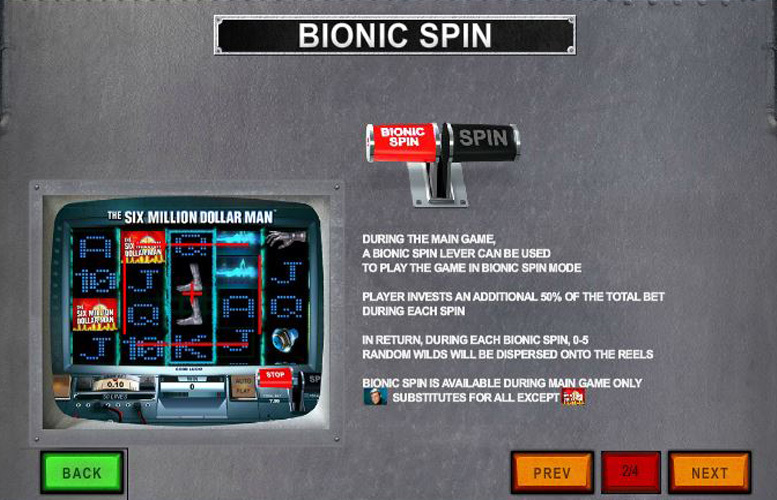 During this bonus features, players must invest an additional 50% of the total bet for every bionic spin. In return, during each spin between zero and five random “wild” symbols will be dispersed on to the reels. Of course, this leads to considerably greater chances of winning. Players should note that the “Bionic Spin” is only available during the main game and the random additional “wild” symbols can substitute for any symbol except the “scatter”. 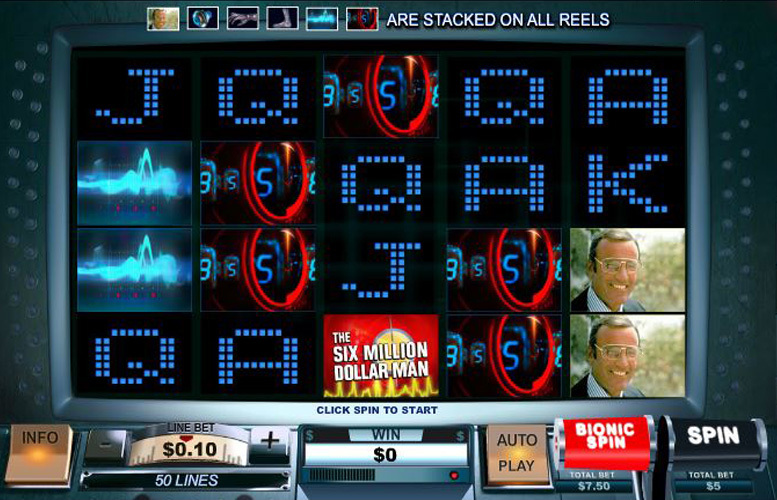 Landing three or more of the “Six Million Dollar Man” game logo “scatter” symbols anywhere on the reels will award players with 15 free games. 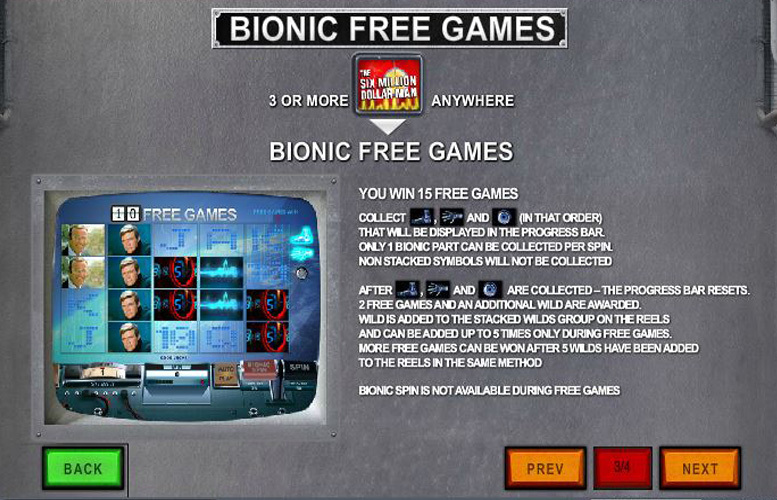 During these spins, if players are fortunate enough to collect all the bionic limbs available (displayed in the progress bar), they will win an additional two free spins with an additional randomly placed wild symbol adding to the stacked wilds group on the reels. This can be repeated up to five times during free games. The entire free game mode can be retriggered after the additional five wilds have been awarded, and the player lands three or more “scatters” again during the free spins. As well as those symbols that are thematically relevant to the franchise, there are also some that pay players lesser sums. Following a popular trend in slot machine design, these have been taken from the upper end of a standard deck of playing cards (A, K, Q, J, 10). They’ve been represented in typical “1980s vision of the future” fashion by using blocky, digitised characters. Queen, Jack, or Ten = 125x the line bet. There is only one option for players to vary the amount they bet on the Six Million Dollar Man slot machine. This is to adjust the amount of cash bet per win line. The maximum value here is £25, and the minimum just 1p. Since the number of win lines are fixed at 50, the largest possible bet per spin is an impressive £1,250 and the smallest is just 50p. The Six Million Dollar Man slot machine therefore caters well to all bankroll sizes. 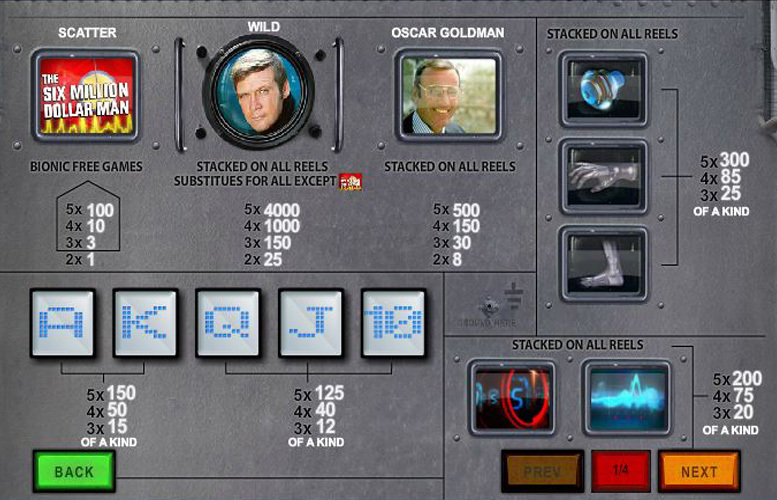 All told, the Six Million Dollar Man is a solid slot machine from one of the industry’s leading developers. It uses the theme of the original TV series to great effect, and the choice of symbols, backgrounds and music create a suitable atmosphere akin to the content of the franchise. If it wasn’t for the fact that one of the game’s primary features must be paid extra for, this would be one of our favourite machines. It’s still good, and with a second free-to-play bonus it’d be great. However, withholding content for those who pay the extra doesn’t sit so smoothly with us, and this unfortunately must mark the title down. This game has a rating of 4 / 5 with 584 total reviews by the users.